The Milwaukee Rep presents "Black Pearl Sings"
A big, beautiful voice streams through the open door of a warden's office in 1933 — a voice full of power and pain. Smartly-dressed Susannah Mullally (the instantly-likable Colleen Madden) shouts for the prison guard to bring in that voice. Enter the imposing Alberta "Pearl" Johnson (the commanding Lynette DuPree), clad in stripes and weighed down by a ball and chain. The stark contrast of these two women — prim vs. imprisoned, white vs. black — sets curiosity in motion. Where will Black Pearl Sings! take these heroines? Turns out, Susannah is an ambitious song collector for the Library of Congress, visiting this Texas prison in hopes of uncovering (and recording) spiritual and folk songs of old. As an African-American woman in the 1930s, Pearl is privy to many melodies passed down from her parents and grandparents — some of them slave songs, rooted in African heritage. Fired up at the prospect of tracing a song all the way back to Africa, Susannah asks Pearl to sing for her and her recording machine. Pearl obliges, but on the condition that Susannah help track down her only daughter, who is missing in Houston. The two women form a quick bond. For Susannah, she hopes a song discovery will secure her a job at Harvard — the first ever given to a woman. For Pearl, Susannah's machine may be her one ticket to freedom. As the story unfolds, Pearl's a cappella spirituals pepper each scene — some somber, others downright jubilant. Take me to church, Ms. Dupree! From the moment the first notes escape her lips, the soulful songstress consistently delivers transfixing, stirring vocals, and it's marvelous to behold. Arresting though DuPree's natural instrument is, she finds a worthy ally in Madden's Susannah. With easy confidence, Madden portrays a different type of 1930s woman — one born into privilege — with a different set of problems: even a white woman is still a woman in a man's world. 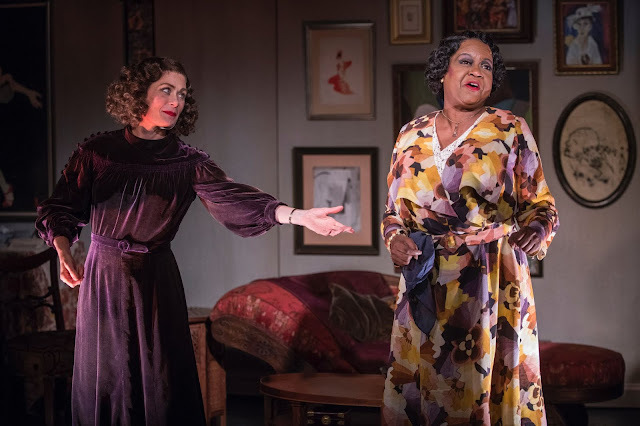 Madden's feisty spirit and gumption are a perfect tonal answer to DuPree's more solemn moments, and watching these two women work the Cabaret together is a joy. The journey of Black Pearl Sings! is one that's best left to be experienced live, but in a brief non-spoiler: the show doesn't end in a prison cell. 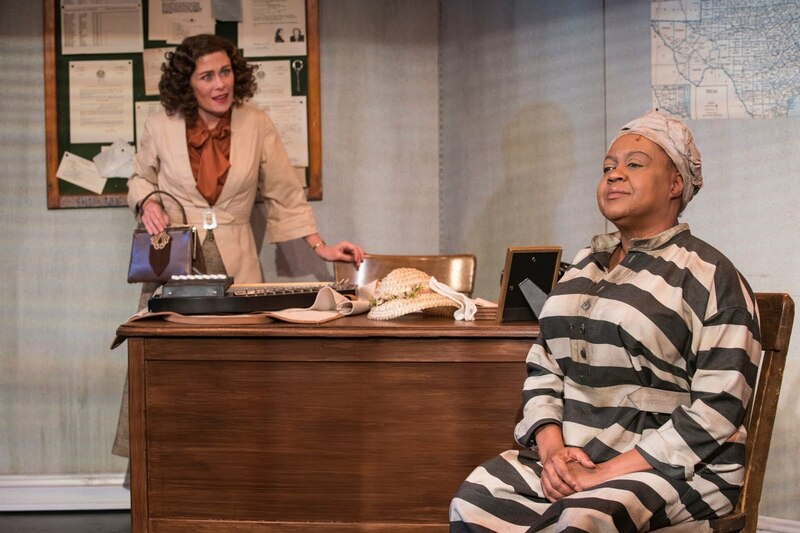 Though its themes of race and gender inequality may not be the expected dinner-theater fare (this is a play with music, not a musical), there is plenty in this Milwaukee Rep production to hope and rejoice in — not to mention timely take-aways. Black Pearl Sings! shines a light on the value of unlikely friendships — specifically, female friendships and women who build each other up in the face of unrelenting adversity. Moreover, Black Pearl Sings! drives home the power of song as a means of passing down a rich, storied past. It's a fascinating concept — the idea of gathering words and melodies as a way to preserve and honor history. Oral legend and spiritual hymns speak volumes about cultures whose histories have been otherwise silenced by the man in charge. These songs are their folklore, and the chance to hear such songs reveals a world full of stories that are largely unknown. Kudos to the exuberant, awe-inspiring women of the Rep's Black Pearl Sings! for sharing one such story. Black Pearl Sings! is playing now through March 18th at the Milwaukee Rep. Information and tickets at milwaukeerep.com. First Stage presents "The Miraculous Journey of Edward Tulane"
"If you have no intention of loving or being loved, then the whole journey is pointless," says an antique doll to the weary porcelain rabbit named Edward Tulane. Even on paper, Edward's story sounds enchanting: Can a toy rabbit, swept away on a decades-long journey of joy, loss, fear, and loneliness, truly come to know the miracle of love? First Stage delivers on that enchantment. Director John Maclay admits in his program notes that this is his favorite kind of play — one "with a tight company of six actors playing two dozen characters while also performing as musicians." The scene is simply set. A piano waits against a wood slat and shingled backdrop as a trio of musicians emerge. The Traveler (the marvelously multi-talented Kat Wodtke) strums her guitar and begins the storytelling. Though Wodtke glides through a handful of bit parts throughout the play, she is the narrator first and foremost. 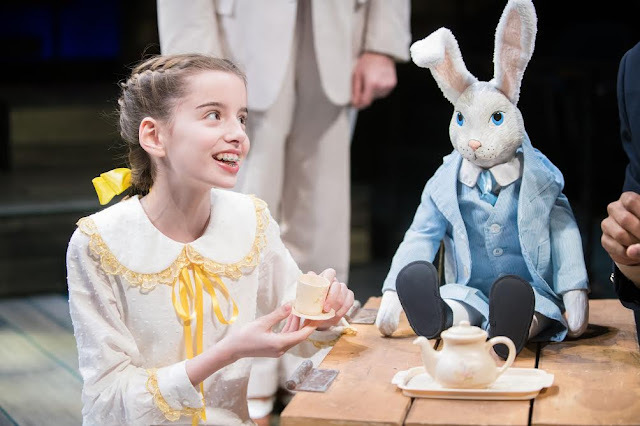 She tells of 10-year-old Abeline (played by the bright, plucky Bryn Dresselhuys in the Cassiopeia Cast) who has just been gifted a fine, white, porcelain rabbit — handmade in Paris, and named Edward Tulane. "Edward" because he looks quite distinguished, and "Tulane" for the family name. The gift comes from Abeline's rather mysterious Grandmother Pellegrina (the delightful and versatile Karen Estrada), who seems to be able to read the rabbit's thoughts. 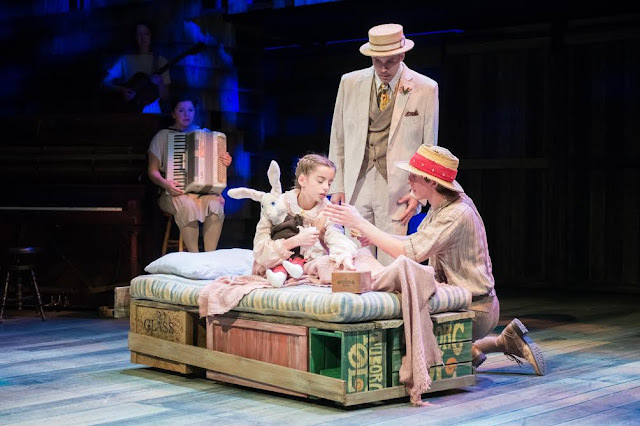 Those thoughts manifest in the brilliant Matt Daniels, who dons a dapper suit and hat, follows toy Edward around the stage, and interjects the rabbit's many thoughts throughout the course of his journey. At the onset, though Abeline adores her porcelain friend, Edward is nothing short of a pompous pill — a part that Daniels plays with such insufferable, whiny flair, it's easy to dislike this toy for all his vanity and pride. But the journey slowly shifts Edward's tone. It starts when Edward is accidentally tossed overboard during an ocean voyage with Abeline. Face-down in the muck at the bottom of the sea for 290 days, Edward learns loneliness. He's rescued by Lawrence the fisherman (Brian Keys), who renames the rabbit "Susanna" and takes him home to wife Nellie (Estrada). Nellie confides in Edward that she and Lawrence once lost a young child to sickness. Edward listens and, as he begins to fill the void in Nellie's heart, learns to care for someone other than himself: "In his listening, his heart opened wide then wider still." Daniels' Edward gracefully navigates this growth. Edward Tulane does indeed do a miraculous job of engaging a broad spectrum of emotion. Following Estrada's poignant Nellie, Edward finds himself in the hands of a wandering hobo (Keys) and his dog Lucy (Estrada). The canine puppet is an instant delight — a simple stuffed prop that, thanks to Estrada, brings a special kind of joy to the stage. But that joy isn't lasting, as Edward eventually lands in the home of Sarah Ruth, a sick little girl (Dresselhuys), and her brother Bryce (the young Bradley Nowacek). Hats off to these two young performers, who deliver an intimate, affecting scene. Throughout the play, a large part of the magic lies in the execution. Every choice encourages the imagination, from the simple sets, to the hundred tiny lightbulbs as twinkling (sometimes-mocking) stars, to the playfulness of a small cast taking on role after role. After all, that's what play is for a child: Make-believing they're anyone or anything, stepping into the shoes of the Other, and gleaning something about those others along the way. Further enhancing the experience, First Stage provides youngsters with educational materials, pre-show questions, and post-show talk-backs — invaluable supplementary tools that spur curiosity and conversation. It's a wholistic approach that nurtures not just a child's art appreciation, but their entire being — their critical thinking skills and even their emotional development and moral compass. Now that's a truly miraculous journey worth taking. The Miraculous Journey of Edward Tulane is playing now through February 11th at First Stage. Information and tickets at firststage.org. The Milwaukee Rep presents "Animal Farm"
Bleak. Cold. Apocalyptic. Even before the house lights dimmed, the mood was already dreary. The stage is laden with a mess of concrete, metal, and a visual manifestation of shattered dreams for what would be a rather brain-wrenching, hope-dashing 90 minutes. Of course, that's just what Orwell's novel is meant to convey. As the Rep describes it, Animal Farm is a "timeless and devastating allegory of idealism betrayed by the desire for personal power." The story begins at Manor Farm, where the barbarously-treated animals long for a better world. Old Major, a wise boar in the twilight of his life, addresses the animals, calling for rebellion and teaching them the song of the revolution, "Beasts of England." Horses, sheep, pigs, and mules alike band together to drive out the abusive Farmer Jones. Together, they create Animal Farm — a place where all animals are equal and all creatures abide by seven noble commandments. But when two pigs, Napoleon and Snowball, step up to the plate as leaders, "equal" doesn't last for long. The horses are overworked and illiterate, the sheep follow the pigs' rule blindly, and the swine leaders slowly twist every one of their seven commandments to suit their own selfish agenda — an agenda of power, leisure, and greed. As Director May Adrales says, "There will always be those that exploit others in order to gain advantage. There will always be pigs." 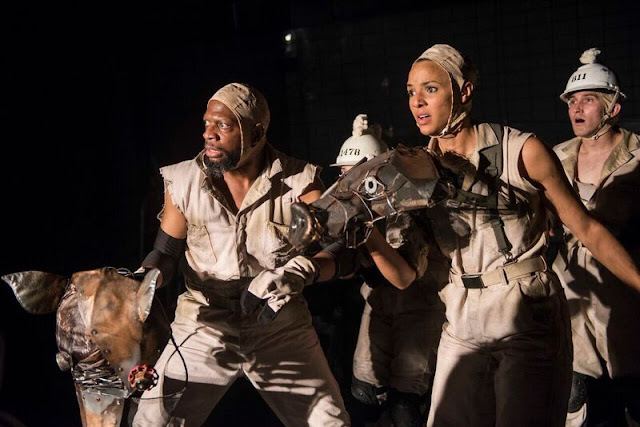 The Rep's Animal Farm certainly drives home this vicious cycle of revolution, newfound power, and newly-broken dreams. However, if you're waiting to applaud a glimmer of hope in the future as the actors take their bow, you've come to the wrong farm. The Rep really does deliver on the bleakness — but to the success of the play and justice to Owell's story? It's complicated. Sure, there's the always-terrific Deborah Staples as Clover, the horse whose optimistic spark perseveres. But her last hopeful monologue comes prior to the final scene, where the pigs-in-charge are now walking on two feet, donning human clothes, and feasting with humans. In short, the pigs and the humans are at last one and the same. It's grim, and though that may be as Orwell intended, the heaviness of the content paired with certain modes of execution sometimes outweigh the enjoyment of Animal Farm's finer points. Beyond the missing note of hope, certain things about the production felt like wannabe edgy, rather than actual edgy. Though the inventive costumes were a bright spot, small plush animals were bandied about in some scenes; it felt borderline juvenile and detracted from the otherwise remarkable costuming. Turns out there's good weird and, well, not-so-good weird. Imagine the weirdness for these seasoned actors having to whinny, bleat, and snort-oink for their supper. That can't be an easy task. Yet they commit to their respective creatures — stand-outs being the aforementioned Deborah Staples, along with Stephanie Weeks as both the inspiring Old Major and loyal Boxer (a workhorse), and Tiffany Rachelle Stewart as both Mollie (a stuck-up mare) and Squealer (a press secretary pig) — each elitist in their own way. Weeks brings palpable passion and heart to the stage, while Stewart works her prancing pony costume like a true diva, drawing the lion's share of smiles and laughter. Along with fine performances, the costumes are truly the jewel of Animal Farm. Costume Designer Izumi Inaba's creations buoy the imagination, as each sculpted animal head captures the look and essence of its character. Though there are multiple pigs and horses in the play, no two look alike. The fussy mare, Mollie, boasts soft curves and a coquettish expression. Boxer the workhorse appears sturdy and strong. There's no question that Animal Farm is as relevant today as it was in 1945. Orwell's story drives home themes of fake news, misinformation, the rewriting of history, appeals to vapid statistics and false "science," the harm of illiteracy, the squashing of education, and the troubling idea that if the corrupt people in power deem that our best times are here and now, it must be so. To resist would mean certain revolution — and the vicious cycle goes on. 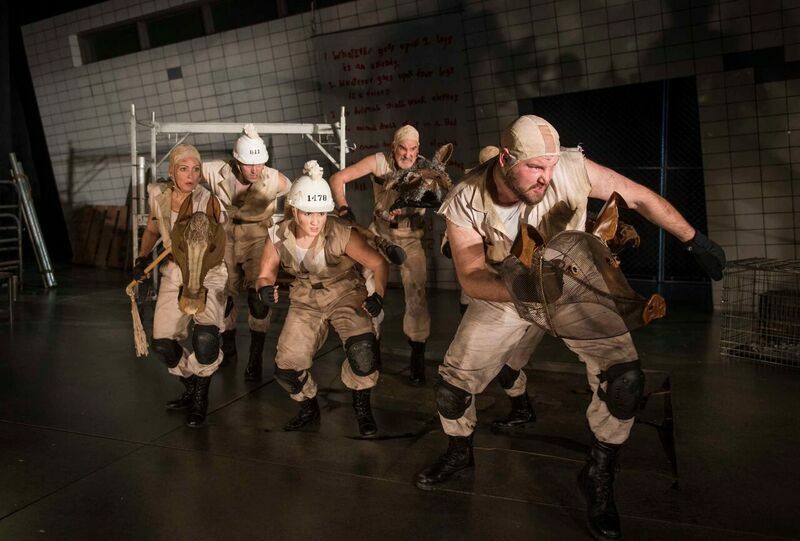 The point being made at the Milwaukee Rep's Animal Farm isn't a treat, but neither is our own political reality. While a portion of the audience visits the theater to escape that reality and find some lightness for an evening, others enjoy getting riled up by the blatant themes this story hammers home. Done well, gut-wrenching social commentary makes for brilliant, thought-provoking theater. In the end, this Animal Farm did indeed provoke thoughts — albeit, mixed ones. Animal Farm is playing now through February 11th at the Milwaukee Rep. Information and tickets at milwaukeerep.com. I've been a Waitress fangirl ever since my first listen to the Sara Bareilles concept album in 2015. With beautiful melodies, meaningful words, catchy little numbers, and an overall uplifting zeal, it was easy to get hooked. So hooked, in fact, I almost immediately hopped on Amazon and ordered Adrienne Shelly's beloved film by the same name. Shelly's Waitress, which inspired the stage show, tells the story of Jenna — a small-town diner waitress who winds up pregnant in a loveless marriage. 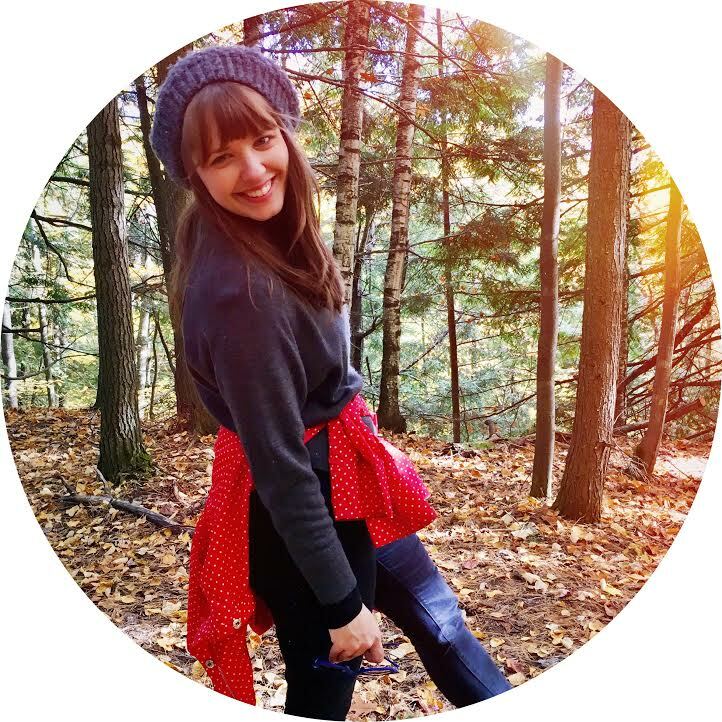 Jenna dreams of a fresh start and takes daily solace in the magic of baking, pouring all of her hopes and fears into the scrumptious pies she invents. With an adorable new baby doctor in town and a pie contest (with a pretty sum of prize money) in a nearby county, that fresh start could be just around the bend. In the meantime, Jenna's got her fellow waitresses, Becky and Dawn, to lean on and laugh with. In the musical, the Bareilles-penned score really drives home the girl power. Given the composer's own remarkable range as a vocalist, it's no wonder her music and lyrics mirror that range — so it's also no wonder that finding top female talent is a must. I'm thrilled to report that this touring cast has nailed it in that department. As Jenna, Desi Oakley's clear, sweet voice is utterly transcendent. Did my jaw ever leave the floor? You couldn't ask for a better lead. Rounding out the female cast is Charity Angel Dawson as the sassy, soulful Becky, and Lenne Klingaman as the hilariously quirky Dawn. The two ladies more than hold their own; both Dawson and Klingaman ace the delivery of their respective spotlight songs, "I Didn't Plan It" and "When He Sees Me." 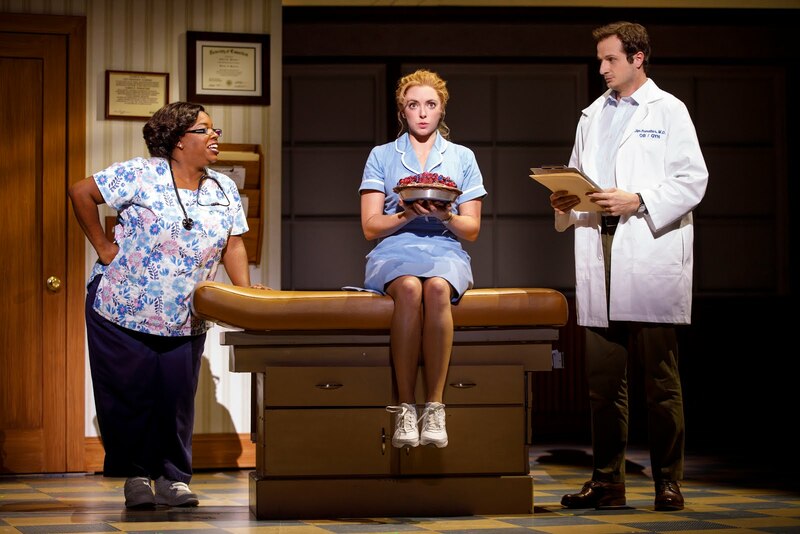 While some of the humor of the show feels a bit hard to read if you're stuck sitting outside of Prime Orchestra (shifty-eyed awkward pauses, playful stare-downs — the kinds of actions better seen on screen than a big stage), Klingaman's physical comedy brings delightful, larger-than-life laughs to Waitress. But the most laughs actually went to Jeremy Morse as Ogie, Dawn's seriously smitten speed-date-on-the-cusp-of-stalker. My only regret is that this laugh-out-loud breath of fresh air doesn't enter the story until the end of the Act One. One could argue that more of Ogie could be too much — but I think a dash more, earlier on, would do the trick. His big song, "Never Getting Rid of Me," left the audience grinning from ear to ear with uproarious applause. Then there are a handful of other supporting fellas in the cast: Nick Bailey as Jenna's good-for-nothing husband, Larry Marshall as the curmudgeonly diner owner, Ryan G. Dunkin as the no-nonsense diner cook Cal (who gets his share of laughs), and Bryan Fenkart as the goofy-cute Dr. Pomatter. While the doctor's gawky vibe is endearing throughout most of the show (shout out to "It Only Takes A Taste" and "Bad Idea"), it makes the heart-fluttering duet "You Matter To Me" feel a little bit out of left field. For me, had the good doctor displayed a pinch of charm through the goofiness, the song might hold as much meaning on stage as it does while listening at home. That's my one struggle with Waitress. The songs themselves have moved me so much in these past couple of years of listening, my expectations were exceedingly high on Milwaukee's opening night. I'll happily reiterate that this touring cast would undoubtedly make Sara Bareilles proud. From the leads to the charming chorus, they nailed every number, and Desi Oakley quickly brought me to tears during the show-stopping "She Used To Be Mine." 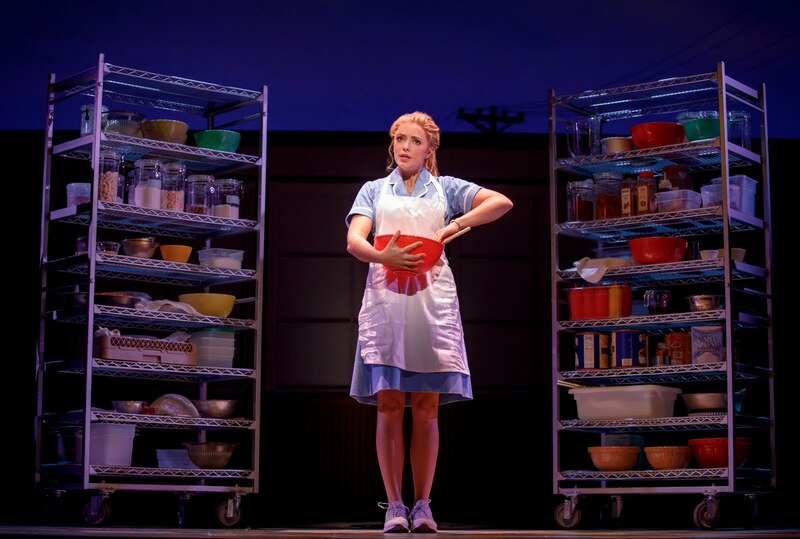 But parts of Waitress left me feeling like there's some ingredient missing. The aforementioned nuanced humor and quiet moments between Jenna and Dr. Pomatter, which may move you on screen, are instead punctuated by an auditorium full of coughing theatergoers and some whirring noise at the Marcus Center (was it the heating system?) befuddling the senses. Instead of laughing at the sometimes-subtle one-liners or getting lost in certain would-be sweet moments, I just found myself feeling a little lost. Still, it all comes together in the end, and the moments that soar greatly outweigh any that fell a little flat. 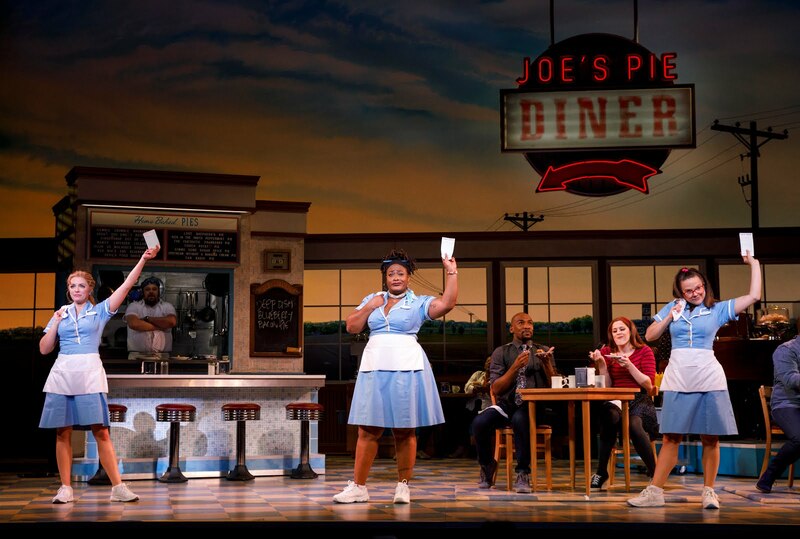 Waitress is an uplifting, joyful experience — and not just for its message of hope, passion, the love of friendship, the magic of pie, and digging deep to find what you're made of. It's also uplifting in that it boasts an entirely female creative team — the first on Broadway of its kind. How very empowering in today's world that there exists this artful testament to womanhood and motherhood. A show made by women, for women. For me, that alone kicks up emotion, right in the pit of my stomach. 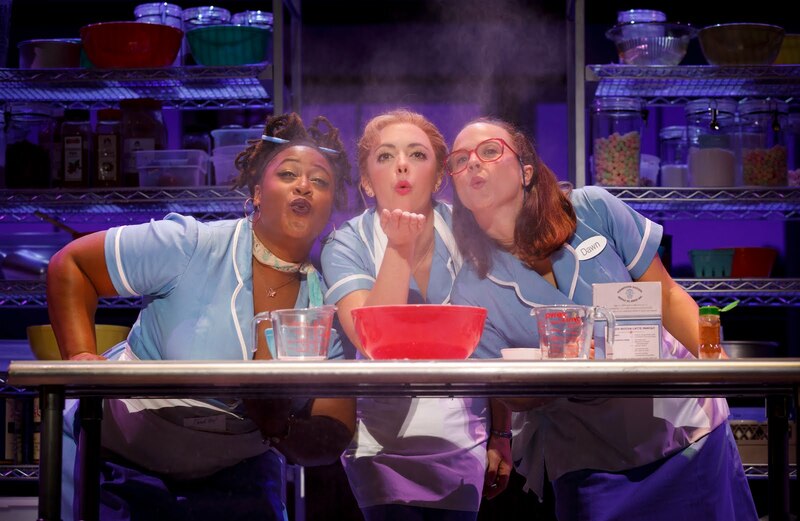 Waitress is indeed a triumph, and the hope of it speaking to women everywhere — encouraging fortitude, shining a light on female friendships, and pushing us all to be brave enough to stand up to our enemies in the pursuit of happiness — it's incredibly moving, and leaves me hungry for more.